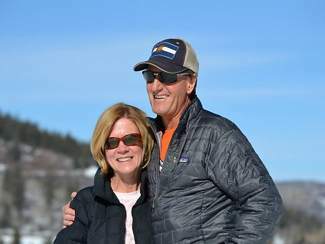 Jon and Sherri Zdechlik met in Summit County, both local. Jon "Zeke" Zdechlik died on Saturday after a three-year battle with lung cancer. His memorial service will be held this Friday, at Saint Mary's Catholic Church in Breckenridge, at 1 p.m. Location: Saint Mary’s Catholic Church, 109 S. French St., Breckenridge. In lieu of flowers, the family asks that contributions be sent to Wells Fargo Bank, Jon Zdechlik Memorial Fund, #7307456702. FRISCO — Known as a Nordic athlete, coach, father and husband, Frisco resident Jon “Zeke” Zdechlik died on late Saturday night after a three-year battle with lung cancer. Zdechlik was a longtime member of the Ski & Snowboard Club Vail community. He was a parent to four Nordic athletes and a Nordic coach. Zdechlik was diagnosed with stage-four, small cell carcinoma, or lung cancer, shortly before Thanksgiving in November of 2013. The diagnosis came as a shock — Zdechlik, an active cross-country skier, had never smoked a day in his life. But, he wouldn’t let the cancer keep him down. Despite the constant chemotherapy and radiation, he continued to work as a general manager for Frisco’s Adventure Park, where he had worked for three years, up until last week. An active local, Zdechlik grew up in Summit County, first meeting Kreamelmeyer, his seventh-grade English teacher, before they worked together years later. A talented athlete, Zdechlik skied for the U.S. Nordic Combined team after high school before attending the University of Vermont, where he studied recreation management. Zdechlik and Jon Kreamelmeyer met again in the ’90s, when they both served as Nordic coaches for the U.S. Paralympic team, working with fellow coach Scott Peterson to form “the three amigos.” As they traveled between competitions, the team brought home gold multiple times. Their trips always involved a fair share of practical jokes. Jon Kreamelmeyer said that as they waxed everyone’s skis, sometimes they would switch waxes on Zdechlik. “It would not be uncommon for one of us to grab one of his skis and put the totally incorrect wax on one of them to slow him down a little bit,” Jon Kreamelmeyer laughed. He remembered this past Saturday, when he visited Zdechlik, grateful to have another moment with his friend. “I said, ‘I’m gonna wax your skis and put a little special red (a type of wax) on them.’ And, he looked at me and gave me a wink,” Jon Kreamelmeyer said. He also recounted a story when Zdechlik was young, practicing a jump off of a 40-meter ski hill, the tallest in the county at the time. Zdechlik is survived by his wife, Sherri, and their four children. A memorial service is planned for this Friday at 1 p.m. at Saint Mary’s Catholic Church in Breckenridge. “It’s open to anybody and everybody (who) would be willing to come celebrate with the family,” Claudia Kreamelmeyer said. A reception will be held afterwards at Beaver Run Resort. The family requests that instead of flowers that contributions be sent to the Jon Zdechlik Memorial Fund through Wells Fargo Bank, No. 7307456702. More details can be found through Zdechlik’s CaringBridge page.